Reduces the noise inside a building to acceptable levels without sacrificing daylight. No matter where it originates, from railways, aircraft or factories, noise is all around. Future trend research suggests that traffic and noise in general will only get worse. The careful and considered selection of glass can be crucial in helping to reduce noise level and meet noise requirements. 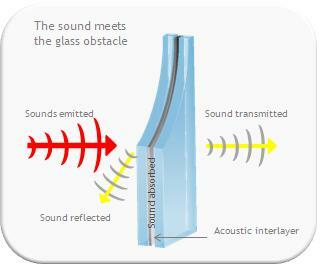 The highest noise insulation is achieved using an acoustic laminated glass. Absorbing the noise energy within the glass. We can improve the sound insulation of glass in different ways - increasing the thickness of the pane, using laminated glass on its own or within an Insulating Glass Unit (the larger the gap between the panes, the better the insulation). The best performance is however obtained when using an acoustic laminated glass such as Pilkington Optiphon™, and for the highest noise insulation, within an Insulating Glass Unit, Pilkington Insulight™ Phon. Our range of sound insulating laminated safety glass, Pilkington Optiphon™ and Pilkington Insulight™ Phon insulating glass unit offer the highest sound insulation. The desired acoustic performance can be achieved through various product combinations, depending on the specific noise reduction required.